Commercial artist who worked in advertising throughout his life including motoring pieces. Chris Rooke spent his childhood in Chigwell and after an initial brief period in a stockbroker’s office he realised that a career in art was his calling. His first unpaid commission was a Dunlop Tyres poster of an earth moving machine. Little is known about his pre-war work, but he was a detached house owner in Chigwell and could afford a new SS 100 sports car, so he must have been successful! In the early 1940s, Sir Kenneth Clark seconded Chris onto the team of artists assigned to paint the ‘Recording Britain’ series of books that he was producing. Chris’s original watercolour ‘Interior of the Church of St Mary, Whitby’ published in these volumes is held by the V&A, who list him under ‘Horace Rooke’. During the remaining war years he served as an infantryman but his artistic skills were soon recognised and he was transferred to work at the School of Military Engineering as an illustrator. He was originally based at Chatham but then moved north to Ripon. While there he worked with a number of famous artists including Terence Cuneo. At Ripon, Chris illustrated manuals including one describing how to assemble a Bailey Bridge. He also produced 3D topographical models used to add realism to enemy targets and landing beaches etc. 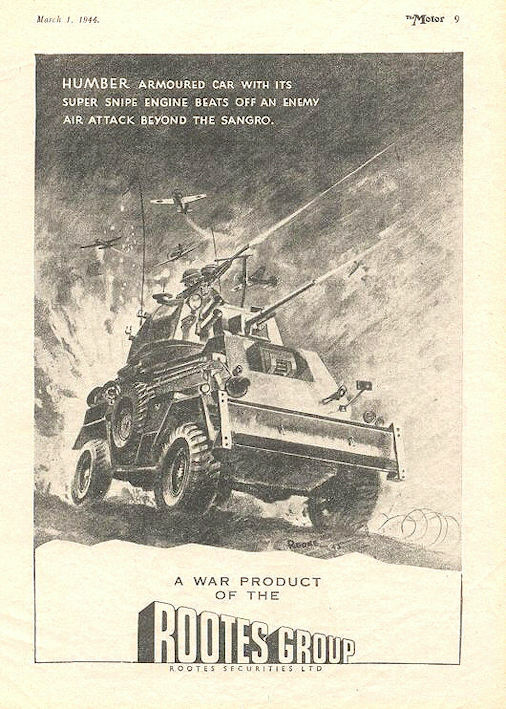 During this period he was obviously still doing some commercial work as here is a Rootes Group Humber advert. Postwar he continued with his freelancing commercial work but also worked for the Rome Studios in Soho. Their clients included Ford and Morris besides the more usual general companies such as Persil and Daz. He also produced artwork for the Rootes Group including work on Hillman Imp and Sunbeam Alpine plus some MGB studies for BMC. By this time he had moved to Bexhill where he worked and lived for the rest of his life. With increasing age commissions diminished and this gave him more time to pursue his own art interests including landscapes, architectural studies, cars, boats and planes. 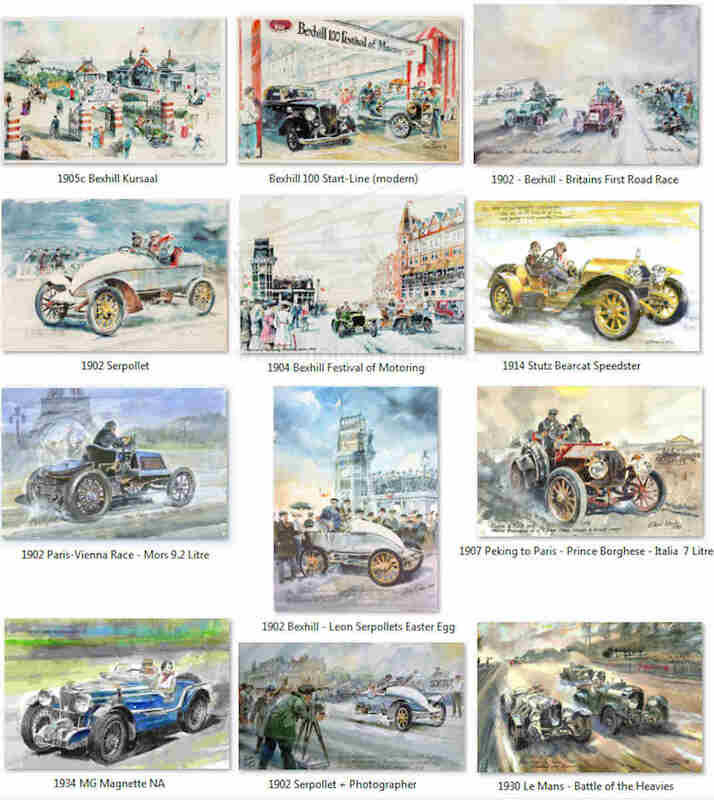 He was particularly interested in the history of the early Bexhill motor races and completed several watercolour studies of early cars. Some of his art was sold by a gallery in Bexhill. He recalled his motoring work in an article in the Daily Telegraph in 1997. He said that “Manufacturers always wanted us to make their cars longer, wider, lower and more attractive than they actually were. Rootes was the worst. It was always changing things; the colours of the cars, the backgrounds, everything”. He was also asked to visualise how publicity material might look. “They always wanted the car to look as exciting and modern and dynamic as possible, so I would put something like a speeding helicopter. They loved that”. His daughter Brenda Barratt is also an accomplished artist and on her website she includes a page ‘My Dad’ in which she gives details and a photograph of Chris Rooke and some of his art.